The 'polluter pays' principle is enshrined in Article 130(2) of the EU Treaty and serves as the basis of the Environmental Liability Directive, based on the precautionary principle. The directive was approved by the European Parliament and the Council of Ministers, which represents EU member states, in February 2004 after a conciliation committee had ironed out persisting disagreements between the two EU lawmaking institutions. These included remedies, the harmonisation of financial security and maritime claims. On 12 October 2010, the Commission backed down on proposals to introduce a mandatory EU-wide financial liability scheme forcing companies to pay for environmental damage, saying that it should be up to member states to decide whether or not to impose their own schemes. It also reported that lack of awareness was a major problem and was preventing the directive from being effectively applied. The EU's Environmental Liability Directive (ELD), adopted in 2004, covers damage to protected species and natural habitats as well as damage to water and land. In specific instances, air pollution may also be covered by the directive. As a general rule, polluters should bear the full cost of prevention and clean-ups. The authorities may help cover those costs but only as a means of last resort. During clean-up operations, the authorities must be satisfied that natural resources have been restored to the state that they were in before damage occurred. Companies have to inform the authorities of any "imminent threat" of environmental damage, even if preventive measures have already been taken. When damage does take place, they must take practical steps to limit its scope or prevent it from worsening. Strict liability refers to damage caused by a specific list of economic activities, such as landfill or waste transportation and incineration (see the ELD's annex for full list). This means that criminal intent need not be proven in these fields. Fault-based liability concerns protected species and natural habitats, meaning that proof of negligence must be produced in order to make the operator pay for environmental damage. However, important exemptions were introduced after heated negotiations between the European Parliament and the EU's member states. Maritime pollution incidents, contamination of genetically-modified organisms (GMOs) and nuclear damage were excluded from the scope of the directive. In addition, if damage is caused by a product that was not considered likely to cause such damage according to scientific knowledge at the time, the operator cannot be made liable for rectifying the situation. This principle is known as 'state of the art' defence. If an operator was following national law at the time, as was the case with October 2010's toxic sludge spill in Hungary, it cannot be made liable for environmental damage either. 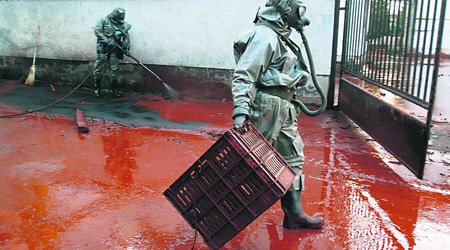 In situations that are not covered by the scope of the Environmental Liability Directive, member states are bound by 1992's International Convention on Civil Liability for Oil Pollution Damage, 1992's International Convention on the Establishment of an International Fund for Compensation for Oil Pollution Damage, 2001's International Convention on Civil Liability for Bunker Oil Pollution Damage and 1996's International Convention on Liability and Compensation for Damage in Connection with the Carriage of Hazardous and Noxious Substances by Sea. Large companies are covered by the directive but not damage caused by society at large or by individuals. Marine pollution, GMO contamination and nuclear damage are excluded from the scope of the directive. Private property loss or personal injury are not covered either. When organic farms are contaminated by genetically modified organisms, the damage is "economic" rather than "environmental," according to the directive. This is because as a consequence the farmer is no longer able to sell produce as "organic". In such cases, national law applies instead of the directive, although farms located close to national borders could still clearly be affected by other member states' rulings. As for maritime pollution, the liability of polluters is limited by international maritime conventions (1976's Convention on Limitation of Liability for Maritime Claims; LLMC and 1988's Strasbourg Convention on Liability in Inland Navigation; CLNI). This limitation will be reviewed in a European Commission report on the directive set to be published in 2014. Whether to make insurance schemes compulsory or not was the main point of contention between the European Parliament and member states in negotiations over the ELD. In the end, a compromise was found whereby companies would subscribe to financial security schemes only on a voluntary basis. Article 14 of the directive does, however, oblige member states to take measures to "encourage the development of appropriate financial security instruments" (such as bonds, letters of credit or certification to show the ability of operators to cover damage costs) for businesses likely to be affected. Some national liability schemes currently include financing and insurance, for example in the case of soil contamination in Denmark and damage caused by oil spills in Finland. But many do not. Ironically, Hungary was among the most proactive countries in demanding voluntary insurance schemes. However, the aluminium processing plant behind October 2010's toxic sludge disaster is unlikely to have been insured. But the company has since been nationalised, meaning that the costs will be covered by the taxpayer. A report carried out for European Commission in 2009 showed that Germany and France had the most advanced environmental insurance market, whilst Belgium, Ireland and Poland were amongst those yet to cover various liabilities. One option is to impose compulsory payments on businesses to contribute to a compensatory fund, possibly coupled with operator licensing as required in Ireland, for example. However, experts fear that a dilemma exists here, as compensatory funds may encourage free-riding by operators who feel free to pollute without paying for the full cost of any damage. In October 2010, the Commission issued a report on the possible introduction of mandatory financial security schemes. It decided against proposing a harmonised system of financial security, which would have established a ceiling for compensation and excluded low-risk activities. Following the 2010 BP oil spill in the Gulf of Mexico, the European Commission came under pressure to toughen EU rules on offshore drilling and exploration. An moratorium on oil drilling was on the agenda, but the Commission eventually climbed down and instead called on EU member states to stop granting licences to new installations until safety regimes have been assessed. The Commission communication also set out proposals for EU-wide legislation on offshore oil drilling, stating that companies must pay for damage occurring within 200 nautical miles of the coast. Key requirements for granting licences for hydrocarbon exploration and production "should be defined at EU level," the Commission said, adding that it would table proposals in 2011. The European Parliament passed a non-binding resolution in October calling on the Commission to review current legislation in order to clarify liability for environmental damage caused by accidents on offshore oil platforms by extending 1996's Seveso II Directive to include such scenarios. It criticised the Commission for watering down its proposals after 'meeting oil companies in secret.' However, the Parliament itself had earlier failed to adopt a resolution calling for tighter inspection methods and safety rules for offshore exploration and drilling during a May 2010 debate. By January 2009, seven member states had still not implemented the ELD. Finland, France, Luxembourg, Slovenia, Greece, Austria and the UK were referred to the European Court of Justice for delays in doing so. Austria was the last of the EU's 27 member states to finally implement the directive in April that year. On 12 October 2010, the Commission reported that lack of awareness among operators was a major problem preventing the directive from being as effective as it could be. Operators are often unaware of their specific legal obligations and insurers and other institutions offering financial security are not sufficiently familiar with what is expected of them, the EU executive said. The Commission cannot therefore "draw concrete conclusions on the effectiveness of the directive," it said in its report. The Environmental Justice Foundation quotes a Commission official as saying that ELD cases had not been treated under the correct directive. "We have not seen bad examples of implementation, but we have seen cases not being treated as ELD and treated under other pollution legislation for various reasons," the official said. Moreover, the directive leaves considerable flexibility for member states to decide how to transpose its objectives into law. Differences in how this occurs may have affected the directive's effectiveness. France and the Netherlands are examples of so-called "monist" states, where EU law is treated as equivalent or superior to national law and only requires minor ratification by parliament. However, the UK transposed the requirements of the directive into its own law on Environmental Damage Regulations, adopted in March 2009, taking the so-called "dualist" approach. The country has often been referred to the European Court of Justice for failing to implement environmental legislation. Member states are entitled to take tougher measures at national level than those suggested in the directive. In cases where damage is caused by more than one operator, they can split the costs according to their own set of rules and charge both users and producers of the incriminated product. They are also required to co-operate on prevention and clean-ups, mainly by exchanging information. This includes the possibility of recovering costs incurred by damage which has originated in another member state. The European Commission is now analysing all existing EU and national legislation and Environment Commissioner Janez Poto?nik may come out with new legislative and policy proposals at the end of 2010. A proposal to introduce a strategy to improve the implementation of the bloc's environmental rules is on the Commission's work programme for 2011. On 9 March 2010, the European Court of Justice (ECJ) ruled on the implementation of the Environmental Liability Directive for the first time. The ECJ concluded that it is only necessary for a member state to establish a weak link of causation between operators' acts and the environmental damage in order to force payment. In a case opposing the Italian economy ministry and a refinery company (Cases C-378/08, C-379/08 and C-380/08), the company charged used a chemical that was also found at the damaged site. This was enough to establish liability, the ECJ said. Not only the refinery company but all actors who owned land at the site were ordered to pay for damages as well as for the preventative measure of constructing barriers to prevent chemicals from entering the sea. When the Environmental Liability Directive was adopted in 2004, the EU's environment commissioner at the time, Margot Wallström, said: "I am delighted that we have finally come so far, after 15 years of trying." The ELD, she said, "will ensure that future environmental damage in the EU is prevented or remedied and that those who cause it are held responsible". "The idea that the polluter must pay is a cornerstone of EU environmental policy, and with the new directive, we are, for the first time, putting the 'polluter pays principle' into practice in a comprehensive manner. The new directive should be a strong incentive to prevent environmental damage from happening at all. I find it particularly important and relevant that the new directive will apply to protected habitats and species at a time when so many threats adversely impact the world's biodiversity." Speaking in the aftermath of the BP oil spill in 2010, EU Energy Commissioner Günther Oettinger described EU legislation based on the 'polluter pays' principle as "serving Europe well, addressing a wide range of risks and challenges associated with this kind of industrial activity". However, he admitted that there was still "scope for improvement with existing legislation" to make it clearer and up to date. "Be assured that, if proven necessary, we will not hesitate to come with legislative initiatives in the coming months," he told the Parliament's plenary session in July 2010. On the issue of passing legislation targeting offshore oil drilling, he said that "safety is non-negotiable. We have to make sure that a disaster similar to the one in the Gulf of Mexico will never happen in European waters. This is why we propose that best practices already existing in Europe will become the standard throughout the European Union". Taking stock of the directive's implementation in June 2010, Hans Lopatta, an official at the European Commission's environment directorate, said the draft conclusions showed that there had only been 50-odd ELD cases so far. One of the reasons for the low number is the "complicated technical requirements and challenges related to economic valuation and remediation methods," Lopatta suggested. He stressed that a broad variety of different implementations across the EU 27 made it difficult to assess the effectiveness of the ELD. "Where the directive gives member states the flexibility to choose what action to take, we see a diverse picture across Europe," he said. The biggest problem with financial liability schemes, he said, may be the "underdeveloped awareness by operators of their ELD liabilities and the available financial security products and markets". Therefore, he saw "awareness-raising with operators as well as brokers" as one of the main challenges to improving the directive's implementation. The European People's Party (EPP) group, the largest in the European Parliament, said environmental policy should tackle the causes of pollution, not the symptoms. Those responsible for environmental damage should pay for the "overall macroeconomic costs" and be given incentives to avoid producing harmful emissions, it said. "Only if we take this into account all operators will then take their responsibilities in this field equally seriously," it added. In May 2003 the Party of European Socialists and the Greens retabled amendments related to four key issues of the directive: its scope, defences and mitigation factors, financial security provisions for companies and changes to the proposal's legal basis. But the European Parliament's rapporteur on the directive sought to tame expectations ahead of the Parliament's first reading in 2004, saying it would be "unworkable to go too far at once". Dutch MEP Toine Manders (Liberals) warned that the EU's upcoming enlargement to ten new member states from Central and Eastern Europe risked delaying the directive's adoption. "If this directive is not accepted in the May plenary, we can forget this very important environmental legislation for the coming decade, because of enlargement," he stressed. The Council of European Municipalities and Regions (CEMR) called on MEPs to reject amendments to the directive that "allow for broad exemptions from liability, limit possibilities for developing an appropriate financial security regime and for authorities to prove that the operator is indeed at fault in order to recover costs". "In the vast majority of these cases it is the taxpayer who, either wholly or partially, meets the cost of the clean-up," the CEMR's environment spokesperson Lucy Swans said in a statement. Europabio, the European Association of Bio-industries, which represents GMO crop manufacturers, called for environmental liability to have clear legal principles. "Operators must be encouraged to conform to environmental standards and should not be held liable where they comply with their permits. This is vital toensure the prevention of environmental damage by emphasising the need to adhere to the conditions in a permit." "Without it, the permitting system will be undermined, and with it the possibility of providing insurance or financial security reduced," it said in a joint statement with Eurochambres, the European network of chambers of commerce. "A clear link between an activity and the damage occurring must be established, with operators liable only for the proportion of the damage they caused," the statement added. Michaela Koller, director-general of CEA, the European Insurance Federation, welcomed the Commission's decision in October 2010 not to impose mandatory insurance scheme on companies, saying it would not be feasible at the moment. The CEA said insurers were facing challenges in developing products because of a lack of available data on ELD claims and on the cost of preventive and remedial measures, due to late implementation of the ELD into national law in many countries. "It is likely to take a number of years before detailed and reliable data emerges, especially where compensatory remediation is involved, as the time required to restore the damaged resource to its previous condition could take several years," said Koller. Lack of data is not the only reason why the CEA believes a compulsory scheme at EU level would not be appropriate. "Such a scheme would face obstacles in terms of differing liability cultures between member states, differences in ELD implementation and different environmental threats," the CEA said. "The current low levels of awareness of the ELD among both operators and the authorities also make a compulsory scheme unfeasible." A review of the directive by Lockton, the world's largest privately-held insurance broker, describes EU member states' compliance with the directive as "untested". Insurance brokers must therefore be "willing to work with a moving target and be creative in developing environmental insurance solutions in the midst of this uncertainty," it states. The Federation of European Risk Management Associations, which represents the manufacturing and financial services sectors, found in a January 2010 survey that 27% of businesses were unaware of the ELD. 58% had not obtained insurance to protect against the risk of paying for environmental damages. And almost none were aware of cases arising from member states transposing the directive into national law. Speaking about the red sludge flows in Hungary, Katerina Ventusova, a Greenpeace expert on toxic substances, warned against claims by the Hungarian government that the disaster was "seven times larger than the incident in Baia Mare" (EURACTIV 06/10/10). "The ecological impact can be very wide and take a long time to neutralise because heavy metals and caustic soda form a very dangerous toxic mix," she told Reuters at the scene. Other NGOs such as the WWF, BirdLife and the European Environmental Bureau say that the current directive leaves several options open as to how member states implement it, engendering the risk that other stakeholders could seek to weaken national legislation. According to the group, "95% of lobbyists making representations to the Commission on the Directive were from trade and industry". They warned that the upcoming review of the directive presented "potential opportunities as well as threats" in this regard. "NGOs at national level should be particularly vigilant as the debates on the transposition of the directive into a national legal system could open the door to attempts to weaken existing national legislation or law," the EEB warns. The NGOs had opposed the introduction 'state-of-the-art' exceptions, which they said would "fundamentally undermine its effectiveness" as many operators would "automatically be granted immunity" for the environmental damage they cause with the introduction of a permit scheme. Environmental NGOs also expressed scepticism over plans to merge several environmental directives including environmental assessment into a single one following a public consultation carried out by the Commission. The organisations regretted not being able to "express opinions on all the important aspects of the directive and specifically on its functioning in practice" during the Commission's public consultation on the directive. Paul de Clerck, corporate accountability campaigner at Friends of the Earth Europe, called for the EU to step up environmental liability for companies operating in the EU and other regions of the world as well. "We call on the heads of state of the EU and the European Commission to hold companies operating in the EU legally accountable for any harm they cause to people and the environment across the world. They must disclose accurate information about their activities. Victims should face no barriers in accessing justice in the EU," he said in a statement. "Shell and other oil companies have spilt as much oil in Nigeria as BP in the Gulf of Mexico. Not even the Nigerian government is stopping them. Continuous oil pollution by European companies in Nigeria is the best example of the urgent need for the EU to take steps to hold European companies accountable for the problems they cause in other parts of the world," he added. MAL.Zrt, the company that owns the alumina plant where a reservoir ruptured in Hungary in October 2010, said in a statement a day after the disaster that the company's management "stands by their responsibility to continually inform the public in a trustworthy manner on the matter". The company also stated that the sludge was not considered hazardous waste under European Union conventions and claimed that it had respected the capacity of the sludge reservoir, while experts pointed out that volume exceeded capacity three times over (EURACTIV 06/10/10). 10 July 1976: Toxic chemical release in Seveso suburb of Milan, Italy. 1982: First 'Seveso Directive' adopted, enforcing the 'need to know' principle, whereby residents should be warned as to the potential danger of industrial sites. 25 April 1998: Dam containing toxic waste bursts at Aznalcoâllar in southern Spain, polluting fauna and crops. 12 Dec. 1999: Erika tanker sinks off the coast of Brittany, France, spilling 20,000 tons of oil. 30 Jan. 2000: 50-100 tonnes of cyanide waste escape dam in Baia Mare, Romania, affecting water supply and fishing industry. 9 Feb. 2000: Commission publishes White Paper on Prevention and Restoration of Significant Environmental Damage. 21 Sept. 2001: AZF fertiliser plant explosion in Toulouse leads France to switch emphasis from "risk management" onto "risk prevention". At European level, the disaster will pave the way for the REACH chemicals regulation. 23 Jan. 2002: Commission tables proposal for a Directive on Environmental Liability. 30 April 2004: Environmental Liability Directive adopted and published in Official Journal. 9 Feb. 2007: Commission tables proposal for a directive on protection of environment through criminal law. April 2007: Deadline for member states to implement the ELD. 19 Nov. 2008: Directive on protection of environment through criminal law adopted and published in Official Journal. 5 Oct. 2010: 'Red sludge' disaster at alumina plant reservoir in Hungary sees 700,000 cubic metres of caustic mud enter the Danube. This chemical spill, the largest since the Environmental Liability Directive (ELD) was passed, is seen as the first test case as to how it will be applied. 12 Oct. 2010: Commission reports on implementation of Environmental Liability Directive (ELD) in the 27 EU member states. It advises against an EU-wide compulsory liability scheme. 26 Dec. 2010: Deadline for member states to transpose EU directive on protection of the environment through criminal law. 30 April 2013: Member states to report to Commission on their experiences of applying 2004 Environmental Liability Directive. 30 April 2014: Commission to propose amendments to 2004 Environmental Liability Directive and report on its complementarity with international environmental treaties. WWF:The European Directive on Environmental Liability – “Polluter Pays”: from principle to practice?